On the road again, we went to St. Louis to see an ailing aunt and my cousins but when you are in the art world there are museums and collectors in most places. Our first art stop was the St. Louis Art Museum where even though the museum was officially closed on Mondays, the curator of European art before 1800, Judy Mann, gave us a tour. It was particularly interesting because a new wing for modern art is being built which means other departments gain more space and all the curators must rethink their collections. We actually saw the re-installation in process and could learn what was going to be done with these collections. Installation and the juxtaposition of works of art offer a new interpretation of a collection. What was also of interest was that the original building was built for the 1904 World's Fair, and how the architect for the new wing, David Chipperfield, was going to integrate the buildings. It seems that he started by asking the curators which of the current galleries worked well for them and what they would like to see the new galleries to look like. He is said to build from the inside out. Obviously there have been many changes in the old building, designed by Cass Gilbert, during the past 100 years and Chipperfield recommended bringing the original building back to its original formation. All these things are an unusual approach for today's museum architects and they are music to a curator's ears. 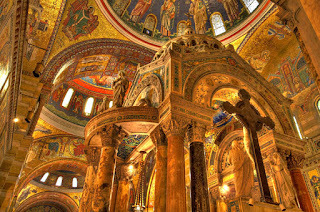 It remains to be seen if he can deliver all that he promises. 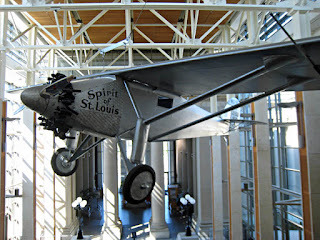 Our next stop was the Missouri History Museum where I was most intrigued by the story of native son Charles Lindbergh. In May of 1927 he made his solo flight to Paris in 33 1/2 hours. His plane, The Spirit of St. Louis, was a mono plane, custom built and had no windscreen (it had a periscope instead), no radio, and no brakes. 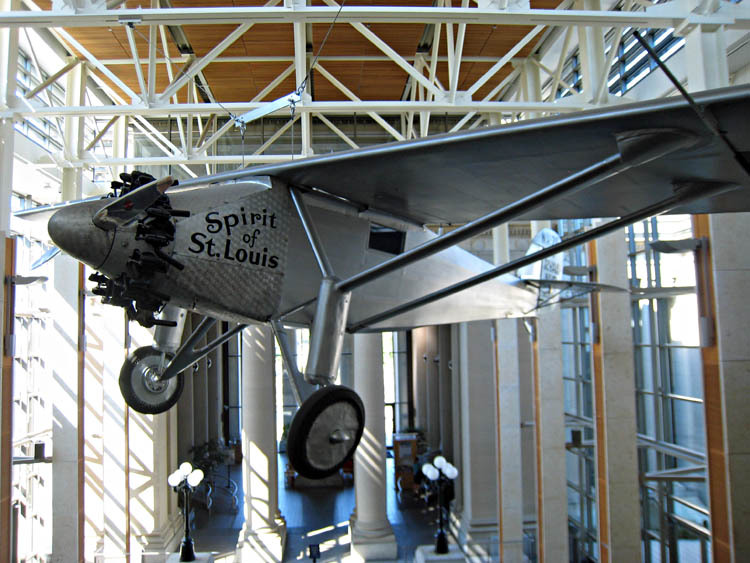 In the center hall is a replica of the plane created for the 1953 movie, The Spirit of St. Louis, with Jimmy Stewart playing the role of Lindbergh who taught Stewart how to fly the plane. That evening we were invited by two excellent and eclectic collectors. The other guests were a curator, a museum director and an art insider. Now, this was an exciting evening with all parties interested about the others' insight into their art world. We probably learned more about St. Louis art politics in a few hours than we could have in months of experience there. The next morning, though the museum is closed both Mondays and Tuesdays, friends gave us an introduction so that we could get a tour by the Curator, Francesca Herndon-Consagra, at the Pulitzer Foundation for the Arts. It is in a building commissioned by Emily Rauh Pulitzer and designed by Tadao Ando. It is a minimalist cement building but very effective with a shallow pool running along the building for relief.What I found unusual was that there has been a tradition of designing exhibitions with the building in mind. Therefore, the curators have always had, though not out of necessity, about 25 works of art in each show. This is the opposite of the approach at the Art Museum where the architect wishes to accommodate the art. The Pulitzer is open to the general public but they do not have an education staff but rather two Social Workers and cater particularly to the homeless, disadvantaged and former convicts. 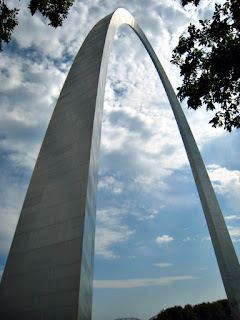 Later we also visited the Museum of Western Expansion based on the exploits of Lewis and Clark which we found under the famous St. Louis Arch, designed by Eero Saarinen, on the Mississippi River. Then we were surprised to find the Basilica Cathedral with it's hundreds of Mosaics done by Italian immigrant laborers between 1912 and 1988. We ended our brief and very full trip visiting a collector to see his print and sculpture collection. He gave us a fabulous tour explaining the provenance and scholarship issues of the pieces. All followed by a dinner under the full moon and stars.